With my ever-present Monterey Bay Aquarium Seafood Watch Guide in hand, I bought some frozen salmon and baked it. I baked extra, for leftovers. As I posted Saturday, some of it was microwaved to death and was mourned by all (except the cat). The remainder, I broke into small pieces. I added minced onion, salt, an egg, and Italian seasoned breadcrumbs. I heated some oil, formed the salmon goop into patties, dredged them in more breadcrumbs, and fried them. Meanwhile, I sliced some leftover baked potatoes and fried them. I tore a couple of huge kale leaves into pieces, tossed them in a little oil and seasoned salt, and baked them at 350 for about 20 minutes until crisp. A WRITING PROMPT FOR YOU: A character visits an aquarium. This entry was posted in Food. 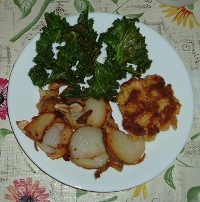 Tagged kale, leftovers, potatoes, recipes, salmon. Such delicious meal indeed. Definitely not bad for a leftover. So you baked the taters…. Hmm.